Google Chrome for PCs launched almost four years ago and became second most popular browser worldwide. But in spite the popularity Google didnâ€™t introduce this browser till now for Android, stock browser in Android is not Google Chrome although based on WebKit rendering. Chrome for Android is the most requested app for Android. Today finally Google released Chrome beta for Android, donâ€™t know what took them this long to launch Chrome for Android. While this is good news for Android users, Chrome for Android beta is only available for Android 4.0 Ice Cream Sandwich devices as of now. Not sure whether GingerBread will get this or not, Chrome blog has no information either. Google says like the desktop version this is also built on speed and simplicity. It also comes seamless syncing, incognito mode, a card view for tabs etc. 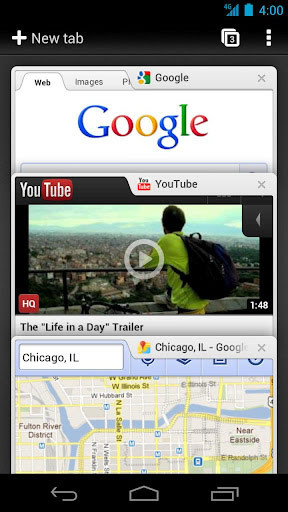 With Chrome for Android scrolling web pages becomes quick. When searching, top search results are loaded in the background as you type for faster loading of pages. Tab navigation is designed in such a way that it fits perfectly into small screens as well as tablets. “You can flip or swipe between an unlimited number of tabs using intuitive gestures, as if youâ€™re holding a deck of cards in the palm of your hands, each one a new window to the web”. Link preview makes it easy to find proper link from sea of links in a page by automatically zooming in on links. Incognito mode is also included in Chrome for Android for that private browsing session. Syncing perhaps is done perfectly, you can sync all your bookmarks between desktop and mobile versions. Not only that you can even sync currently open web pages on desktop from mobile, so you can continue your browsing, you need to login to both desktop Chrome and mobile Chrome for this to work. With seamless sync, card view for tabs etc Chrome for Android looks promising, if it performs like the desktop version I am sure it is going to go popular on Android. Once Chrome reaches final builds from beta this may become the default browser in Android. If you have an Ice Cream Sandwich phone go checkout the Chrome beta.